Western Digital has announced its new lineup of UFS 2.1-based embedded storage devices for smartphones, tablets, PCs, and other mobile applications. The new iNAND MC EU321 drives are based on the company’s 96-layer 3D NAND memory and offer performance comparable to that of entry-level SSDs. 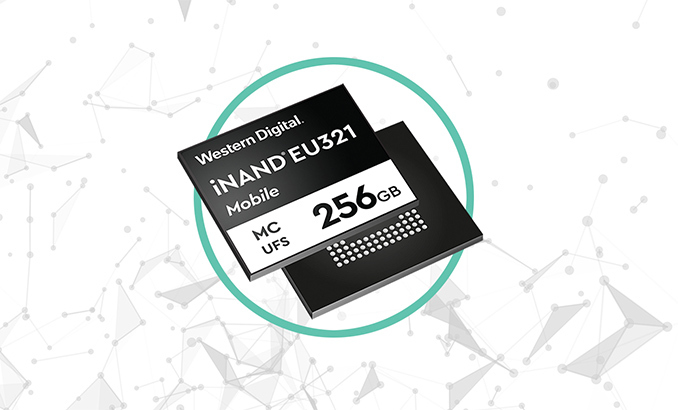 Western Digital’s iNAND MC EU321 embedded flash drives feature capacities between 32 GB and 256 GB, and are based around an in-house controller that supports a UFS 2.1 Gear3 2-lane interface. When it comes to performance, the EFDs are rated for up to 800 MB/s sequential read speed, up to 550 MB/s sequential write speed, and up to 50/52K random read/write IOPS, with these figures presumably including the impact of WD's proprietary iNAND SmartSLC 5.1 caching technology. The iNAND MC EU321 comes in a BGA package that measures by 11.5×13×1 mm, which is small enough for modern smartphones and tablets. Meanwhile, given capacities offered by the new flash drives, they can also be used for laptops, VR headsets, and other kinds of devices that can take advantage of high-performance storage. The new family of iNAND MC E321 embedded flash drives will complement other 3D NAND-based UFS 2.1 offerings from Western Digital and will enable the manufacturer to make such solutions slightly cheaper. Traditionally, memory suppliers do not disclose which specific customers will will use their EFDs, but we should see the first products using the drives shortly. Western Digital has been shipping commercial products based on 96-layer 3D NAND since at least April. The company introduced its first SSD based on this type of memory in July, so the ultra-dense flash from Western Digital is ready for all types of applications. 800/550 read/writ but "only" 50/25k random read/write seems quirky as heck and no mention of TBW data is not so good. "Western Digital has announced its new lineup of UFS 2.1-based embedded storage devices for smartphones, tablets, PCs, and other mobile applications"